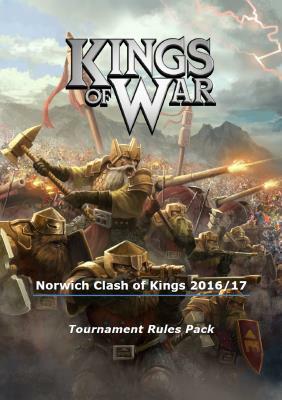 Norwich Clash of Kings will be Aftermath Gaming Club's first Kings of War tournament, the tournament will be split into two separate events, each one copying a day from the official UK Clash of Kings tournament. Each of these events will be a tournament in their own right but will also combine for anyone attending both events to find Norwich's very own Clash of Kings Champion. The first tournament was on the 2nd October 2016 and the games and scenarios were the same as those played on the Saturday of the UK Clash of Kings. There will be prizes courtesy of Mantic games and Aftermath Gaming club. The second tournament will be on 12th March 2017 and the games and scenarios will be the same as those played on the Sunday of the UK Clash of Kings. There will be prizes again courtesy of Mantic games and Aftermath Gaming club. There will then be additional prizes for the best players that attended both events with the best player being crowned Norwich Clash of Kings champion. For a map please visit http://www.tinyurl.com/dx8yzk. Tickets cost £10. There are 20 places available. The tournament is open to players aged 14 and over. If you wish to enter, please click the link below to pay via Paypal. If you have any queries please email the organisers at warmachine@aftermath-tournament.co.uk. Click on the event logo for details.